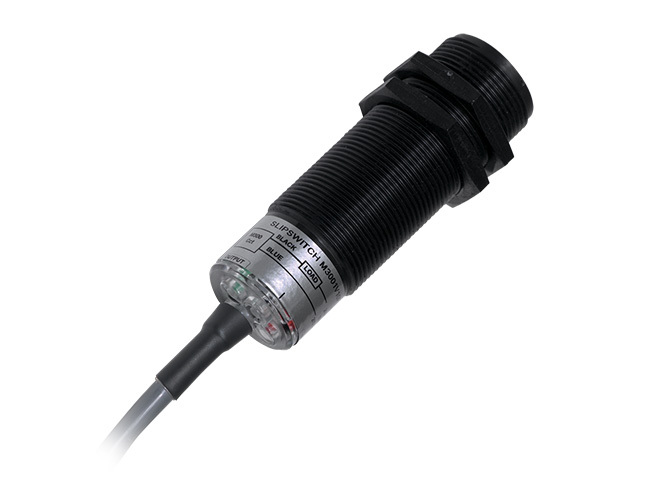 The M300 Slipswitch is a simple inductive shaft speed monitoring device. The self-contained unit has a single set point, which signals when the shaft speed has dropped by 20% of normal running speed. It is used for detecting dangerous slow downs and underspeed on conveyors, bucket elevators, airlocks, mixers, fans, grinders and many other machines. An inductive sensing device located in the nose of the M300 enclosure will detect a metal target. This target can be an existing bolt head or device attached to a shaft. During installation the M300 is set to the normal machine shaft RPM by calibrating with the magnet provided. The internal microprocessor sets the underspeed output to operate at exactly 20% below normal machine shaft RPM. This allows the M300 output to be used for automatic shutdown of machinery during dangerous underspeed or belt slip conditions. How many wires are needed to run the 5 wire version of the M300? Three are needed to run the sensor, talk to our technical staff for more details. How do you program the M300? Be sure to remove any seal tight, this will allow you to see the LED lights and the calibration point on the sensor. To calibrate the sensor, please refer to the operation manual. 10 Essential Tips To Keep Your Hazard Monitoring System Safe.